Is it possible cry diamond tears? A woman suffers from cystinosis which causes her eyes to fill with tiny but painful crystals. Lysosomes are intracellular sacs of enzymes that are responsible for the digestion of macromolecules. The products of the hydrolytic digestion process then leave the lysosome via specific transporters in its membrane, to be either reused by the cell or excreted outwards. A disfunction of one of lysosomal membrane transporters can result in a lysosomal storage disorder. Cystinosis is a lysosomal storage disease characterized by an intralysosomal accumulation of cystine, which is due to defective cystine efflux from these organelles. It is a genetic disorder that typically follows an autosomal recessive inheritance pattern. Its incidence is estimated between 1 in 100,000 and 1 in 200,000 live births. Cystinosis: from gene to desease,2002. Cystinosin, the protein defective in cystinosis, is a H + -driven lysosomal cystine transporter,2001. This autosomal recessive disorder comprises three allelic clinical forms, varying in severity and age of onset. The infantile form, noted as nephropathic cystinosis, generally appears at 6-8 months of age with a proximal renal tubulopathy, which, in the absence of renal transplantation, can lead to death by 10 years of age due to renal failure. Early symptoms of classical nephropathic cystinosis include renal tubular Fanconi syndrome, characterised by the generalized failure of proximal tubules to reabsorb water, electrolytes, bicarbonate, calcium, glucose, phosphate, carnitine, amino acids, and tubular proteins, rickets, impaired growth, hypothyroidism, and photophobia; cystine crystals are apparent on slit lamp examination of the cornea from 16 months of age. Infantile nephropathic cystinosis has a range of severity, but end-stage renal disease ( ESRD ) invariably occurs at approximately 10 years of age. In the late 1960s, renal transplantation came into increasing use, and the lifespan of cystinotic patients was markedly prolonged. However, cystine accumulation continued in non-renal organs, including the muscle, brain, bone marrow, liver, spleen, lymphonodes, cornea, conjunctiva, thyroid, pancreas, testes, and intestines. Consequently, the clinical course of cystinosis changed from that of a largely renal disease to that of a multisystemic disorder with significant non-renal involvement, including a distal vacuolar myopathy, decreased pulmonary function, swallowing impairment, deterioration of the central nervous system (CNS), endocrinopathies, vascular calcifications, retinal damage, and other ophthalmic complications. The juvenile form is characterized by glomerular renal damage, which manifests at around 10-12 years of age and slowly progresses to glomerular insufficiency and photophobia due to corneal cystine-crystal deposits. Finally, the ocular non-nephropathic form is solely characterized by a mild photophobia but no renal anomalies. Nephropathic Cystinosis: Late Complications Of A Multisystemic desease,2007. The involvement of different organ systems in post-transplant individuals with cystinosis means that, without long-term cysteamine therapy, almost every patient will have suffered some major complication by the time they reach 30 years of age. In many cases, a single organ is much more seriously involved than another. Patients with relatively mild renal disease, for example, can manifest the most severe myopathy. Despite the serious medical issues that patients experience, many treated adults function well in their personal and professional lives. The growth of adults with cystinosis who have not received significant cystine-depleting therapy is severely retarded. Adult heights average 144 cm, or approximately 25 cm below the normal mean. Adult weights approximate 45 kg, or 25 kg below normal. Skeletal and pharyngeal muscle involvement occurs commonly in cystinotic patients who survive into their twenties and thirties without cysteamine therapy. The myopathy presents with atrophy and progressive distal weakness, first involving the thenar and hypothenar eminences and the interosseous muscles of the hands, which assume a claw-like posture (Fig. 1b). Later, dysphagia and generalized atrophy supervene. The absence of any sensory deficit correlates with symptoms typical of spinal muscular atrophy. Electromyography shows a myopathic pattern; nerve conduction velocity is normal. Muscle biopsy demonstrates prominent unrimmed vacuoles with small ring fibers but no evidence of endomysial inflammation. Electron microscopy shows the typical rectangular appearance of cystine crystals within perimysial collagen fibrils (Fig. 1c). Free cystine levels in cystinosis muscle increase with age up to 1,000 times greater than normal; even cystinosis myotubes in culture store excess cystine. The increased cystine content of muscle is considered the cause of the vacuolated myopathy of cystinosis. Plasma and muscle carnitine deficiency, impairing mitochondrial fatty acid metabolism, can contribute to lack of energy in muscles, but that occurs early in life because of the Fanconi syndrome; it is not likely to be the cause of the late myopathic complications. Significant muscle wasting leads to progressive oromotor dysfunction, including dysphagia. Trauner’s group described different types of oromotor dysfunction, such as communication and feeding problems, a hyperactive gag reflex, inability to elevate the palate, hoarse voice, inability to perform normal jaw movements, and absent gag reflex. Almost half of the individuals studied showed evidence of at least mild muscle weakness in addition to gross and fine motor impairment on neurologic examination. Sensory and motor nerve conduction velocities and action potentials were in the normal range on electromyography. Progressive myopathic findings also appear in accessory chest muscles, causing extraparenchymal restriction of ventilation. Pulmonary function test results consist of reduced values for maximal inspiratory pressure, maximal expiratory pressure, and maximum voluntary ventilation, indicating decreased respiratory muscle strength and endurance. Pulmonary insufficiency caused by general thoracic muscle weakness is a severely debilitating and sometimes life-threatening complication of cystinosis. The swallowing difficulties in cystinosis, which progress slowly but inexorably, are attributed to destruction of pharyngeal muscles as part of the generalized vacuolar myopathy. Accumulation of cystine in muscle cells causes deterioration of oropharyngeal muscles, which correlates with muscular dysfunction. The majority of patients had significant symptoms of swallowing difficulties such as slow eating (49%), xerostomia, heartburn, choking and airway obstruction (20%), and pain with swallowing (7%). Many patients manifested hypophonic speech and had poor tongue and lip strength. Because swallowing difficulties can lead to aspiration pneumonias, feeding problems and poor nutrition, some patients should be examined for placement of a feeding tube. Although rare, CNS complications do occur in adults with cystinosis. Most commonly, a generalized cerebral atrophy is apparent on brain CT scan, occasionally with superimposed calcifications of the basal ganglia and periventricular areas (Fig. 2a). A cystinosis encephalopathy involves mental deterioration, impaired cerebellar function, and pyramidal signs. Its occurrence does not correlate with other extrarenal complications of cystinosis, but its frequency does correlate directly with age. The pathogenesis could be related to neurotoxicity involving oligodendrocytes. Another constellation of clinical symptoms includes progressive bradykinesia, dementia and spasticity. In some patients with profound neurological deficits, CT scans revealed cerebral involvement with atrophy, multifocal cystic necrosis, dystrophic calcification, extensive demyelination of the internal capsule, spongy changes in the brachium pontis, and vacuolization. Electron microscopy showed deposition of cystine crystals in membrane-bound cytoplasmic vacuoles of pericytes and within parenchymal cells of white matter. Another aspect of cerebral involvement in cystinosis is idiopathic intracranial hypertension, or pseudotumor cerebri, presenting as headache, papilledema and ophthalmoplegia. Examination of the cerebrospinal fluid (CSF) gives normal findings, except for elevated pressure. Hypercoagulability due to renal disease, or impaired CSF resorption in the arachnoid villi due to cystine deposition, might lead to the development of idiopathic intracranial hypertension in cystinosis. In most cases, acetazolamide treatment or ventriculoperitoneal shunt placement resolves the condition. Non-absorptive hydrocephalus, convulsions, spasticity, cerebral atrophy, ischemic lesions, and multifocal mineralization have also been reported in cystinosis. Some cystinotic patients have abnormal encephalogram results, without seizures. Some later neurological characteristics of cystinotic patients reflect findings that presented earlier in life. Children with cystinosis have mean full scale IQs in the low normal range, with impaired tactile recognition of common objects and difficulty processing visual information. Even children with normal composite IQs have low visual memory subtest scores, and their academic performance is usually lower than normal. Only one study has evaluated the relationship between brain structural changes and cognitive performances. Nichols et al. showed an association between the degree of cortical atrophy and the severity of impairment in visual short-term memory performance. Others reported that children with cystinosis are at greater than normal risk for developing behavioral difficulties and social problems. Besides cystinosis, renal failure, long-standing dialysis, and growth retardation themselves can lead to difficulties in psychosocial adjustment requiring psychotherapy. Ctns-/- mice with cystinosis exhibit behavioral abnormalities consisting of decreased activity and a tendency to walk along the walls of their cages. Arterial hypertension is well-documented in patients with nephropathic cystinosis and ESRD, the majority of whom have renin-dependent hypertension. Blood pressure usually returns to normal after removal of the native kidney. Calcification of various vessels, primarily the coronary arteries, is one of the late complications of cystinosis in patients with transplants. High-resolution CT scans have revealed calcifications in the internal carotid arteries, coronary arteries, aortic arch and abdominal aorta. Most patients with vascular calcifications had not received significant cysteamine therapy, which is consistent with the conclusion that cystinosis itself, and not drug exposure, is a risk factor for this complication. Adult patients should be carefully monitored for myocardial ischemia; some may require stenting or bypass surgery. The hypercholesterolemia of cystinosis also puts patients at increased risk of developing cardiovascular complications. Cardiomyopathy and death associated with a ruptured pseudoaneurysm has been documented in one patient. Four patients have been described with coronary artery dilatation, and one with an aneurysm in the descending aorta. There are reports of myocardial cystine deposition, and electron microscopy has revealed rectangular intralysosomal crystals within interstitial histiocytes adjacent to myocytes. In patients with nephropathic cystinosis, growth improves after restoration of renal function by kidney transplantation. Hypothyroidism, however, becomes more frequent in post-transplant patients without cysteamine therapy, so that three-fourths of cystinotic patients require thyroid hormone supplementation by the time they are 30 years old. In addition, untreated cystinotic patients nearly always exhibit late sexual maturation. In male patients, puberty starts at 16–17 years of age, and many show evidence of primary hypogonadism. Parenchymal tissue destruction and cystine accumulation within the testes have been reported in late stages of the disease (Fig.2b). Winkler et al. suggested that male patients develop hypergonadotropic hypogonadism due to progressive alteration in the gonadal tissue. In fact, most untreated men with cystinosis have low levels of testosterone and high levels of luteinizing hormone (LH) and follicle-stimulating hormone (FSH) and may benefit from testosterone supplements to restore secondary sexual characteristics. Infertility appears to be common in men; no cystinotic patient is known to have fathered a child, although the ability to have an erection apparently remains intact. Girls generally reach puberty at 14–15 years of age. Ovulatory cycles and gonadal endocrine parameters appear normal in female patients, and successful pregnancies and deliveries have been observed in women with cystinosis; the condition of the offspring has been completely normal. Although hypothyroidism was initially considered to be the only endocrinopathy of cystinosis, the development of diabetes mellitus in post-transplant patients has been repeatedly documented. Hyperglycemia is exacerbated by the use of prednisone after transplantation, and its frequency has been reported at 50–80% of young adults with cystinosis. Postmortem results have shown a markedly increased pancreatic beta cell fraction, possibly due to cystine’s interference with insulin secretion. The findings of oral glucose tolerance tests are abnormal, and many patients require insulin replacement therapy. Untreated cystinotic patients can develop gastrointestinal symptoms in the second or third decade of life. The spectrum of involvement is diverse, and the frequency is greater than previously recognized. In patients of all ages, approximately 77% have documented feeding abnormalities due to reflux, dysmotility, pseudo-obstruction, or swallowing dysfunction. Mild hepatomegaly, a common feature of nephropathic cystinosis, is rarely associated with overt symptoms of liver cell dysfunction. One case of hepatic veno-occlusive disease has been reported. Two cases of portal hypertension have been described, with evidence of nodular regenerative hyperplasia, but the pathogenesis remains to be defined. Cystine deposition in Kupffer cells is common, and hepatocyte atrophy, regenerative nodules and gastropathy with varices have also been described. Portal hypertension has been reported in the absence of bridging fibrosis. Some patients have required portocaval shunting, for esophageal varices and gastrointestinal bleeding, or splenectomy for hypersplenism, thrombocytopenia, leucopenia, and anemia. Exocrine pancreatic insufficiency has been documented in cystinosis, indicating that the entire pancreas can be affected. The reported patient exhibited fat malabsorption and responded to pancreatic enzyme supplements. Treem et al. reported inflammatory bowel disease in a patient with severe cystinosis and multisystemic involvement. Intestinal biopsy revealed crystals in histiocytes of the lamina propria. The deaths of several adult patients have been attributed to intestinal perforation with sepsis or peritonitis. It has been proposed that persistent constipation associated with muscle weakness and failure to thrive could be the first clinical symptom of cystinosis, even before evidence of renal Fanconi syndrome. Early therapy that effectively addresses the mechanical, anatomic, emotional, and behavioral problems associated with feeding can lessen mealtime discomfort and improve the quality of life for affected patients. Cystinosis eventually affects almost all parts of the eye, particularly the anterior chamber. The cornea becomes hazy by the time the patient is approximately 20 years of age, and a band keratopathy (Fig. 2a) can develop. Chronic photophobia and its resultant squinting can lead to irreversible blepharospasm (Fig. 2c). In addition, many patients develop posterior synechiae, i.e. scar tissue anchoring the posterior lens to the iris. As a consequence, the eye cannot accommodate to light by constriction of the pupil, and this contributes to photophobia. Scarring also predisposes to angle closure glaucoma. In the Ctns-/- mouse, cystine crystals accumulate in the tissue surrounding the optic nerve, similar to the location of crystals in the pial septa of the optic nerve of cystinotic patients. In the posterior chamber, the primary area of involvement is the retina, due to loss of retinal pigment epithelia. The first symptoms are poor color vision and impaired night vision, appearing in adolescence or early adulthood with a frequency of approximately 5%. These impairments, considered to be due to damaged rods and cones because of poor nutrient function of the supporting retinal pigment epithelial cells, are followed by impaired visual acuity. Electroretinograms document the retinopathy. Cystinotic patients who have received a renal allograft have several risk factors for developing osteopenia, including crystal deposition in bone, hypothyroidism, primary hypogonadism in male patients, chronic urinary phosphate wasting, renal failure, and prolonged treatment with corticosteroids. In a study, bone mineral density, measured by dual energy X-ray absorptiometry (DEXA), was significantly reduced in both adults and children after transplantation, and approximately one-third of patients had multiple fractures. Many patients developed metabolic bone disease with abnormal micro-architecture on biopsy. In some patients, the DEXA scan was normal, despite a history of frequent fractures, meaning that linear densitometry can be misleading in the diagnosis of bone fragility. Physicians should be aware that osteopenia and bone fragility may occur in cystinotic patients, despite successful kidney transplantation and correction of metabolic mineral losses. Early diagnosis is crucial for cystinotic patients, in order that preventive and therapeutic management, including cystine-depleting therapy, could be started. The symptoms of nephropathic cystinosis have a broad differential diagnosis, but a family history combined with certain clinical and laboratory findings, particularly those associated with renal tubular Fanconi syndrome, may be highly suggestive. In addition to growth retardation, polyuria and polydipsia also affect infants, who often urinate 2–6 l per day. Aminoaciduria and increased secretion of solutes, particularly phosphate, should prompt investigations into cystinosis. Chemical analyses of serum reveal hypokalemia, acidosis, elevated levels of alkaline phosphatase, and, sometimes, hypocalcemia and hypercholesterolemia. Urine electrolyte excretion is increased, urine specific gravity is very low, and tubular proteinuria is evident. Elevated TSH and reduced free thyroxine levels can be seen in mid–late childhood. The diagnosis of cystinosis is confirmed by measurement of the cystine levels in mixed leucocyte preparations moderately enriched in polymorphonuclear leucocytes or, previously, in cultured fibroblasts. Cystine concentrations in individuals with classical nephropathic cystinosis are 5–23 nmol half-cystine/mg cell protein; in heterozygous individuals, the levels are less than 1.0 nmol half-cystine/mg cell protein (normal <0.2 half-cystine/mg cell protein). Leucocyte cystine values in ocular cystinosis are generally 1–3 nmol half-cystine/mg protein, and, in intermediate cystinosis, they are slightly higher. Corneal crystals are apparent on slit lamp examination after 16 months of age (fig. 3b). Their appearance can be confirmatory for the diagnosis of cystinosis, but the absence of corneal crystals should not be used to exclude the diagnosis, especially in infants. A variety of tissues, including bone marrow, conjunctiva, and kidney, have been biopsied to diagnose cystinosis, but these invasive procedures are no longer indicated. When a previous sibling has been diagnosed with cystinosis, prenatal diagnosis can be made by measurement of elevated free cystine levels in cultured amniocytes or samples of chorionic villi. Neonatal diagnosis can be achieved by the measurement of cystine in the placenta or in leucocytes after birth, prompting rapid initiation of treatment. Cystinosis is due to a mutation in the gene CTNS which was identified using positional cloning strategy. CTNS is localized to chromosome 17 ( 17p13 ) and is composed of 12 exons, the first two of which are non-coding. The remaining 10 exons encode a 367-amino-acid protein, cystinosin, which contains seven transmembrane domains ( TM ), a 128-amino-acid N-terminal region bearing seven N-glycosylation sites, and a 10-amino-acid cytosolic C-terminal tail ( Fig.5 ). The most common mutation, associated with cystinosis is a 57 kb deletion that removes the 59 region of the gene upstream of, and including, exon 10. This mutation is found in 76% of cystinotic patients of European origin and has been shown to be due to a founder effect that probably arose in the middle of the first millennium. CTNS mutations have been detected in all forms of the disease confirming their allelic status. Most of the mutations associated with the infantile form are loss of function mutations; however, some point mutations have been detected and these are generally found to cluster in the TM, particularly in the last three, and are thought to have a severe effect on cystinosin structure. In contrast, point mutations are more commonly associated with the milder forms and are generally found in the inter-TM loops or in the N-terminal region. Individuals with infantile cystinosis carry ‘severe’ mutations on both alleles, whereas individuals with milder forms of the disease carry either one ‘severe’ and one ‘mild’ mutation, or two ‘mild’ mutations. Interestingly, three mutations have also been described in the CTNS promoter region, which extends 316 bp upstream of the start of exon 1, and have been shown to reduce promoter activity. In the C-terminal tail of cystinosin resides a GYDQL motif that resembles the lysosomal targeting motif found in the tail of other lysosomal membrane proteins. Mutation or deletion of this motif, in particular of the Y and L residues, resulted in partial redirection to the plasma membrane. A signal remained in the lysosomes is suggestive of a second lysosomal targeting motif, which was determined to lie in the fifth inter-TM loop. Deletion of the first half of this loop, in particular a YFPQA pentapeptide, coupled to the deletion of the GYDQL motif, resulted in a complete relocalization of cystinosin to the plasma membrane. In contrast, point mutations of the YFPQA motif had a less dramatic effect on the relocalization of cystinosin, suggesting that the conformation of this motif is more important than its specific sequence. This suggests that it is probably recognized as part of a secondary structure formed by the 5th inter-TM loop. What is particularly interesting about this second motif is that it is one of the first examples of a lysosomal sorting signal situated elsewhere than in the cytoplasmic tail. It is tempting to speculate that the YFPQA motif represents a rescue pathway by which cystinosin can be sorted to lysosomes. Cystinosin is the cystine lysosomal membrane transporter. Cystinosin-mediated cystine transport is saturable and follows Michaelis-Menten kinetics with a mean Km of 278 . This protein acts as cystine/H+ symporter that exports cystine out of the lysosomes. In fact its activity is stimulated by Mg-ATP, necessary to fuel H+/ATPase which acidifies lysosomal lumen by pumping in H+ ions. So both the electrical and pH components of the transmembrane electrochemical gradient created by the H+/ATPase are able to drive cystine efflux. In cystinotic patients this process is altered ( Fig.4 ) and cystine, the disulfide of the amino acid cysteine, is unable to leave lysosomes; this situation results in cystine crystals formation, due to its poor aequous solubility. The crystals are generally hexagonal or rectangular, but can also be needle-like (Fig. 6); they are birefringent under polarized light. The extent of crystal formation does not correlate with the severity of damage to a tissue. For example, the liver and intestine have immense intracellular cystine crystal formation, and yet they manifest symptoms only rarely. This may be explained by the extensive functional reserve of certain organs or by their rapid rates of cell turnover. Cystinosis is a monogenic hereditary disease caused by mutations or deletions in the ubiquitous gene CTNS. This gene encodes a seven-transmembrane lysosomal protein, which is a proton-driven cystine transporter. However, the physiopathology of cystinosis suggests that cystinosin has other functions and/or other genes influence the pace and extent of the disease. This could explain the high variability in age of the appearance and severity of the complications observed in patients taking cysteamine, which allows cystine to exit the lysosomes. ADP, adenosine diphosphate; ATP, adenosine triphosphate; P i , inorganic phosphate. The Pathogenesis Of Cystinosis: Mechanisms Beyond Cystine Accumulation,2010. Despite the fact that the CTNS gene was cloned more than 10 years ago, the pathogenesis of nephropathic cystinosis is not yet fully understood. In particular, no convincing explanation has been documented linking lysosomal cystine accumulation to cell dysfunction and renal Fanconi syndrome. Nevertheless, three major hypotheses have been proposed over the past years, namely, altered ATP metabolism, increased apoptosis, and cell oxidation. For the most part, these hypotheses have been formulated using cell models and are not necessarily mutually exclusive. A mechanism that may explain the biochemical basis for the pathophysiology is based on the observation that lysosomal cystine accumulation leads to cellular ATP depletion. ATP depletion in cystinosis was first observed in a cystinosis model (based on loading lysosomes with cystine by cystine dimethyl ester, CDME). In this study, it was also further suggested that the decreased ATP in cystinotic cells would lead to a decrease in Na+/K+-ATPase activity. As this pump generates a Na+ gradient that allows reabsorption of amino acids, phosphate, glucose and other solutes in the proximal tubules of the kidney, defective pumping owing to decreased ATP levels would decrease uptake and thus lead to the severe phenotypes. As the CDME model of cystinosis is not a fully acceptable model owing to the oxidative stress induced by CDME itself, fibroblast cells from cystinotic patients have also been used to investigate the disease. It was observed that significant ATP depletion also occurs in cystinotic fibroblast cells. However, whether ATP depletion is a triggering factor leading to the clinical manifestations has not been conclusively established. The cause behind the decreased ATP levels seen in cystinotic cells was initially thought to be a consequence of a defect in mitochondrial ATP-generating capacity due to the mitochondria possibly becoming dysfunctional in these cells . However, recent studies have clearly shown that there is no defect in the mitochondrial ATP-generating capacity in cystinotic fibroblasts. Specifically, it has been observed unaltered activities of the respiratory chain complexes I, II, III, and IV, which generate the proton gradient in the inner mitochondrial membrane that allows for ATP synthesis by complex V. Moreover, the recent development of an assay to measure complex V activity in cell homogenates allowed to compare complex V-mediated ATP production in control and cystinotic fibroblasts. In line with the observation of intact mitochondrial ATP production, normal expression and activity of complex V in cystinotic fibroblasts have been witnessed. Despite ATP depletion being an important and possibly key phenomenon in cystinotic cells, the mechanism by which ATP is depleted in these cells continues to remain a puzzle. Among the possibilities that have been speculated upon include increased ATP consumption or altered glycolysis, but neither of these possibilities have yet been experimentally evaluated . In addition to ATP depletion, cystinotic cells have also been found to have lower levels of glutathione that also might enhance apoptosis in these cells. Furthermore, the levels of cysteine in the cytosol of cystinotic cells are actually lower than normal, despite these cells having high levels of intralysosomal cystine. In the presence of high levels of cystine, measuring the cytosolic cysteine levels has actually been difficult; however, the ability of cysteine precursors to refurbish the low glutathione levels of these cells to normal levels suggests that cytosolic cysteine is indeed limiting in these cells. Cysteine is the most limiting nutrient in the glutathione biosynthetic pathway, and it appears that in cystinotic cells they are significantly more limiting. This is because the lysosomal cystine which is likely to be a pool for cytosolic cysteine is no more available to the cells, thereby leading to cysteine deficiency conditions in the cell despite the high levels of intralysosomal cystine. Another intriguing observation in patients with nephropathic cystinosis is the almost 60-fold higher levels of 5-oxoproline (*pyroglutamic acid*) detected in the urine of these patients. These high levels of 5-oxoproline were found to return to normal levels when these patients were subjected to cysteamine therapy. The excess 5-oxoproline has been explained as being due to a defect in the γ-glutamyl cycle . However, how a defective γ-glutamyl cycle could lead to 5-oxoproline secretion has not been explained. 5-oxoprolinuria (pyroglutamicaciduria) has otherwise been observed in patients who lack the 5-oxoprolinase enzyme or the second enzyme of glutathione biosynthesis (glutathione synthase). A model has been proposed to explain ATP-depletion in cystinotic cells. In this hypothesis ATP-depletion would be a consequence of the formation of a futile cycle involving two ATP-dependant γ-glutamyl cycle enzymes, γ-GCS and 5-oxoprolinase, leading to the continuous depletion of 2 molecules of ATP per cycle. Figure 7: A schematic representation showing how ATP depletion occurs in cystinosis through a futile cycle of two ATP-dependant γactivation of ampk plays a role -glutamyl cycle enzymes, γ-glutamylcysteine synthetase and 5-oxoprolinase. (1) γ-glutamylcysteine synthetase; (2) Autocyclization of activated glutamate; (3) Glutathione synthetase; (4) γ-glutamyltranspeptidase; (5) cinylglycine dipeptidase; (6) γ-glutamylcyclotransferase; (7) 5-Oxoprolinase; (8) Cysteinyl tRNA synthetase; (9) Protein synthesis; (10) Lysosomal degradation of cellularproteins; (11) Disulphide exchange reaction; (12) Cystine transporter (cystinosin, CTNS); (13) Cystine reductase; (14) cystineimporter. GSH, glutathione; aa, amino acid.The bold arrow indicates the unusual reaction of γ-glutamylcysteine synthetase under cysteine-limiting conditions that leads to 5-oxoproline formation. X indicates a defective cystine transporter seen in cystinosis. The γ-GCS enzyme (also known as glutamate-cysteine ligase) is the first enzyme and the regulated step in glutathione biosynthesis. The reaction involves ligation of glutamate to cysteine and is mediated by ATP leading to the formation of γ-glutamylcysteine. Investigations into the mechanism of the reaction have revealed that the reaction mechanism involves the formation of activated glutamyl phospate. This intermediate remains in the active site before it attacks the second substrate cysteine leading to the removal of phosphate from the glutamate residue and the formation of γ-glutamyl cysteine, adenosine diphosphate (ADP) and Pi. Interestingly, it has also been shown that the γ-GCS enzyme, if it fails to find the acceptor (cysteine) for γ-glutamyl phosphate, can autocyclize the activated γ-glutamyl phosphate to form 5-oxoproline (pyroglutamate). The sequential events leading to ATP depletion in cystinosis can thus be explained as follows. As a consequence of the defective cystinosin gene, the cell is unable to get sufficient levels of cytosolic cysteine. This can result in the formation of 5-oxoproline through the partial reaction of the γ-GCS enzyme as described above. 5-oxoproline, which is a normal metabolite of the γ-glutamyl cycle, can be acted upon by the action of the 5-oxoprolinase enzyme (another ATP-requiring enzyme) to yield glutamate. Thus, glutamate is cycled by the action of two consecutive ATP-dependant enzymes to yield back glutamate (at the expense of two molecules of ATP). However, 5-oxoprolinase is known to be a very inefficient enzyme (being one of the most sluggish enzymes known with a reaction rate of 0.45 nmol/h) and it is likely that not all the 5-oxoproline generated by this reaction would be converted back into glutamate. Increased levels of 5-oxoproline would thereby accumulate in the cells and the excess would be secreted. This explains the high levels of 5-oxoproline observed in the urine of patients with nephropathic cystinosis. The glutamate that is cycled 23 back can once again feed into the γ-GCS enzyme leading again to the formation of 5-oxoproline in the absence of sufficient amounts of cytosolic cysteine. Thus, by the continuous action of the ATP-dependant γ-GCS and the ATP-dependant 5-oxoprolinase, the cell is forced into a futile cycle leading to ATP depletion. Furthemore, as the cellular glutathione levels are low (owing to lower cytosolic cysteine levels), feedback inhibition of γ-GCS by glutathione would be reduced. This would result in greater activity of the enzyme and increase cycling through the futile cycle, thereby leading to continuous ATP depletion. The reduced levels of glutathione in cystinosis could also be a major contributor to the higher rate of apoptosis in cystinotic cells, as proposed below. The highly active γ-glutamyl cycle in the kidney explains the severe renal phenotypes in nephrotic cystinosis. The γ-glutamyl cycle is highly active in the kidney since glutathione needs to be made at significant levels for handling the electrophiles encountered, and has also to be effluxed outside the cell to allow for aminoacid reabsorption through γ-glutamyl transpeptidase. γ-GCS constitutes up to 2–3% of the total kidney protein. This, and the fact that significant amounts of ATP are needed in these cells for reabsorption of solutes, suggests why the kidney is the most severely affected organ in cystinosis. ATP depletion could lead to malfunctioning of Na+K+-ATPase, leading to problems in reabsorption from the proximal tubules and the consequent effects that account for some of the clinical symptoms seen in nephropathic cystinosis. Treatment with cysteamine leads to release of cysteine into the cytosol, and the release of cysteine consequently prevents the channelling of ATP into a futile cycle. This can restore the ATP levels, stop excess 5-oxoproline formation, and also restore glutathione levels, thereby preventing further progression of the disease. 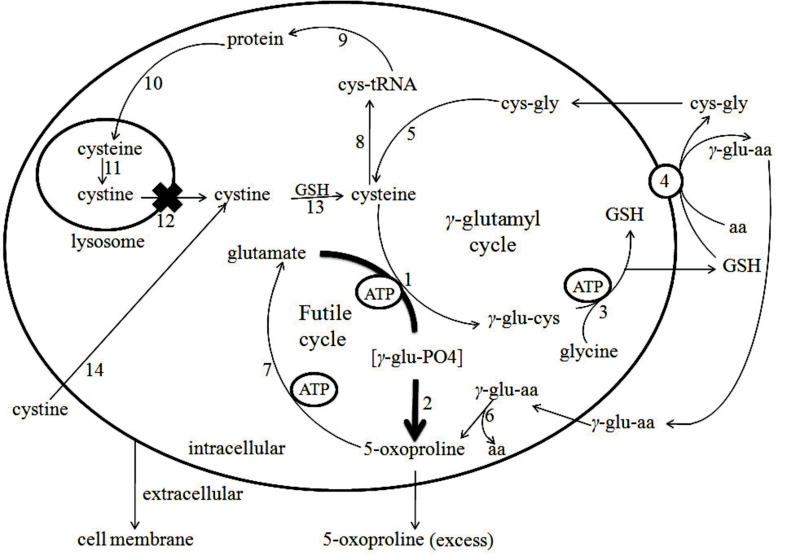 A futile cycle, formed between two ATP-dependant gamma-glutamyl cycle enzymes, gamma-glutamyl cysteine synthetase and 5-oxoprolinase: the cause of cellular ATP depletion in nephrotic cystinosis?,2010. Activation of AMP kinase plays a role in the increased apoptosis in the renal proximal tubule in cystinosis,2012. The decrease in intracellular ATP could have other effects on cell function through the activation of AMPK. AMPK is a heterotrimer, consisting of a catalytic a subunit, in addition to a regulatory b subunit and a regulatory c subunit. Increases in intracellular AMP and in ADP activate the enzyme allosterically, as well by the phosphorylation of the a subunit at Thr-172. In addition, AMPK can be activated independently of changes in energy charge. Once activated, AMPK initiates phosphorylation events that cause processes that consume ATP to be inhibited, and processes that produce ATP to be activated. If conditions are particularly stressful, AMPK affects cell viability, activating processes such as apoptosis and/or autophagy. When AMPK is activated as a consequence of ATP depletion, a number of catabolic metabolic pathways are turned on, so as to generate ATP, while anabolic pathways that consume ATP are turned off. Catabolic pathways that are activated include glycolysis and fatty acid oxidation, while anabolic pathways that are inhibited include lipogenesis and glycogen synthesis. Activated AMPK may act either directly to phosphorylate target proteins, or indirectly on other signaling pathways. Included amongst the targets of AMPK is the mammalian target of rapamycin (*mTOR*), which is inhibited as a consequence of phosphorylation by AMPK . Consequences include reduced protein synthesis and cell growth. The increased apoptosis is mediated by phosphorylation by AMPK-alpha of pro-apoptotic p53 at Ser-46, which is associated with the trascriptional upregulation of pro-apoptotic Bax and p53 AIP1. p53 AIP1, which is localized in mithocondria, is one of direct transcriptional targets of p53 and has an ability to down-regulate mitochondrial membrane potential and thereby release cytochrome c from the mitochondria to the cytoplasm, an intermediate of apoptosis. The release of small amounts of cyt c leads to an interaction with the IP3 receptor (*IP3R*) on the endoplasmic reticulum (ER), causing ER calcium release. The overall increase in calcium triggers a massive release of cyt c, which then acts in the positive feedback loop to maintain ER calcium release through the IP3Rs. This release of cytochrome c in turn activates caspase 9, a cysteine protease. Caspase 9 can then go on to activate caspase 3 and caspase 7, which are responsible for programmed cell death. Another mechanism causing an increase of apoptosis in cystinotic renal proximal tubule epithelial cells (RPTE cells) derives from cysteinylation of Protein Kinase C ( PKC ). Protein kinase C is a proapoptotic protein kinase that shows variuos domains including a C-terminal catalytic domain, an N-terminal regulatory region, and a variable region. A cysteine-rich domain found in the N-terminal region may account for the sensitivity of PKC to cysteinylation. Overexpression of PKC inhibits cell growth, and cleavage of PKC by caspase-3 results in a 40-kD kinase-active fragment, which alone can induce apoptosis. PKC has multiple nuclear substrates, including Lamin-B, a nuclear support protein that must be phosphorylated before it can be cleaved. In early stages of apoptosis, lysosomes become permeabilized, and their contents enter the cytosol in a controlled manner, with concomitant translocation of cathepsins B and D (lysosomal cysteine and serine proteases, respectively) to the cytosol. Cathepsins leaked from lysosomes during apoptosis cleave the mitochondrial membrane transition pore protein Bid to its active form. In addition, lysosome permeabilization causes cystine leakage from lysosomal lumen to cytosol which leads to the specifically formation of disulfide bond between PKC and cystine. Cysteinylation leads to increased PKC activity in cystinotic cells undergoing apoptosis, making them less likely to be rescued from cell death. This leads to generalized hypocellularity and the cystinotic phenotype, including the Fanconi syndrome and glomerular failure. The retinopathy that is found in patients with cystinosis may be due to increased retinal apoptosis, and the short stature may be due to increased apoptosis in the growth plates of long bones. The later pathologic findings (myopathy, neuropathy, diabetes, and ESRD) also may be attributed to aberrantly increased apoptosis. Figure 8: Proposed mechanism of the action of lysosomal cystine on PKC. 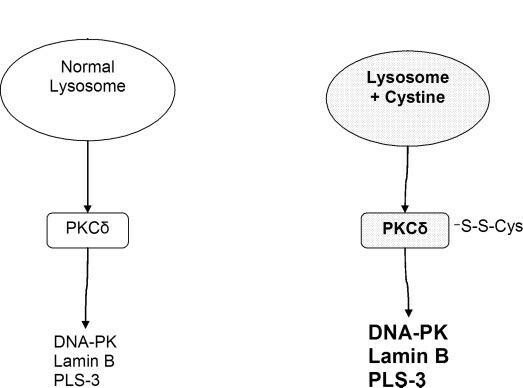 In normal cells (left), lysosomes do not release cystine and PKC activity is not increased. Lysosomal cystine in cystinotic cells (right) is released during apoptosis and in-creases PKC activity, which in turn phosphorylates multiple targets and promotes apoptosis. Normal cells thus may be rescued from the apoptotic pathway, whereas a cystinotic cell under the same conditions proceeds to apoptosis. Activation of AMP-activated protein kinase induces p53-dependent apoptotic cell death in response to energetic stress,2007. Increased Apoptosis in Cystinotic Fibroblasts and Renal Proximal Tubule Epithelial Cells Results from Cysteinylation of Protein Kinase Cδ,2006. Autophagy is a highly orchestrated intracellular bulk degradation process that is activated by various environmental stresses. Autophagy is an intracellular catabolic system that delivers cytoplasmic contents (e.g., proteins, lipids, and organelles) to lysosomes for degradation. There are three major pathways of autophagy in eukaryotic cells, namely macroautophagy, microautophagy, and chaperone-mediated autophagy. Macroautophagy (referred to as autophagy hereafter) involves de novo formation of double-membrane vesicles, termed autophagosomes, which engulf intact organelles (such as mitochondria) and portions of the cytosol. The outer membrane of the autophagosome fuses with an endosome and/or lysosome to form an autolysosome where cytoplasm-derived materials, together with the inner membrane of the autophagosome, are degraded by lysosomal hydrolases. The resulting macromolecules are transported back to the cytosol as an internal source of nutrients to support energy production or biosynthesis. This self- digestion process is well conserved from yeast to human and has an impact on development, immune defense, programmed cell death, neurodegeneration, cancer, and aging. It has been observed an abnormal increase in macroautophagy, specific to the nephropathic variant of cystinosis. Moreover, it has been also demonstrated that specific inhibition of autophagy rescues cell death in nephropathic cystinotic RPTE cells. These results indicate that mitochondrial autophagy may be a critical mechanism contributing to renal Fanconi syndrome and progressive renal injury in nephropathic cystinosis. Abundant vacuolization and abnormal mitochondria are detected by electron microscopy (EM) in nephropathic cystinotic cells. Additionally, elevated levels of LC3-II and Beclin 1 are also observed in nephropathic cystinotic RPTE cells, indicating a role of Beclin 1-mediated autophagy in cystinosis. These results altogether establish an abnormal increase in autophagy in nephropathic cystinotic cells. Renal biopsies from patients with nephropathic cystinosis can reveal abnormally large mitochondria, but the relevance of this finding and other ultrastructural abnormalities is unclear. Target of rapamycin ( TOR ) is a serine/threonine protein kinase involved in regulating cell growth and metabolism. Accumulating evidence indicates that TOR, as well as its mammalian homologue mTOR, functions as the major inhibitory controller of autophagy in the presence of growth factors and abundant nutrients. Rapamycin, an inhibitor of TOR can induce autophagy even under nutrient rich conditions. In mammalian cells, mTOR is part of two structurally and functionally distinct multiprotein complexes termed mTORC1 (containing mTOR, GbL, PRAS40, and raptor), which is highly sensitive to rapamycin and cellular nutrient availability, and mTORC2 (containing mTOR, GbL, mSin1, and rictor), which is insensitive to rapamycin. Raptor is an essential protein for mTOR signaling that acts positively in mTORC1 as scaffold for recruiting downstream substrates such as ribosomal S6 kinase ( p70S6K1 ) and eukaryotic initiation factor 4E binding protein 1 ( 4EBP1 ) to the mTORC1 complex. While nutrient-rich conditions activate mTORC1 through the small GTPase Rheb, nutrient-poor conditions inactivate mTORC1 through AMP-activated protein kinase (AMPK). Active AMPK directly phosphorylates the TSC2 tumor suppressor, leading to the inactivation of Rheb, which directly binds to and activates the mTORC1 kinase. Alternatively, a recent study indicated that AMPK regulates mTOR signaling by directly phosphorylating raptor on two conserved serine residues Ser722 and Ser792. The phosphorylation of raptor by AMPK induces 14-3-3 binding to raptor, which is required for the inhibition of mTORC1 and cell cycle arrest induced by energy stress. The serine/threonine kinase Atg1 was the first autophagy regulator identified by genetic screens in yeast for essential autophagy genes. Atg1 interacts with the autophagy regulatory proteins Atg13 and Atg17, and this complex is thought to function downstream of TOR. In mammals, there are two Atg1 homologues, UNC-51-like kinase 1 and 2 (ULK1 and ULK2). While ULK1 plays an important role in the regulation of autophagy, the function of ULK2 in autophagy has not been clearly defined. Similarly to yeast Atg1, ULK1 forms a complex with mammalian Atg13 ( mAtg13 ) and FIP200, the functional analog of yeast Atg17. In this complex, mAtg13 mediates the interaction between FIP200 and ULK1 and is required for the phosphorylation of FIP200 by ULK1 in response to starvation. Moreover, FIP200 is required for the stability and full kinase activity of ULK1. Interestingly, it has recently been shown that mTORC1 associates with the ULK1-mAtg13-FIP200 complex through an interaction between raptor and ULK1 and phosphorylates ULK1 and mAtg13 to repress the kinase activity of ULK1, thereby suppressing the initiation of autophagy. However, the mechanism by which mTOR is controlled to activate ULK1 activity for autophagy induction has not yet been clearly elucidated. Co-immunoprecipitation analyses revealed that AMPK binds to amino acids 654–828 within the proline-serine rich (PS) domain of ULK1. AMPK binding to ULK1 plays an important role in the induction of autophagy. AMPK may activate ULK1 for autophagy induction through the inhibition of mTORC1 activity by phosphorylation of raptor in the ULK1 autophagic complex. It has been reported that AMPK can suppress mTORC1 signaling through direct phosphorylation of TSC2 and raptor. Interestingly, FIP200, an ULK1-binding protein, has been demonstrated to interact with the TSC1/TSC2 complex through TSC1. Thus, it remains to be determined whether TSC1/TSC2 exist in the ULK1 complex and, if so, whether AMPK inhibits the mTORC1 activity not only through phosphorylation of raptor but also through phosphorylation of TSC2 in the ULK1-mTORC1 complex. In mammalian cells, however, ULK1 forms a stable protein complex with mAtg13 and FIP200 regardless of nutrient conditions. Interestingly, mTORC1 dissociates from the ULK1-mAtg13-FIP200 complex under nutrient starvation conditions, and this dissociation was speculated to be the key event leading to ULK1 activation and autophagy induction. Thus, it is possible that AMPK phosphorylation of raptor and subsequent recruitment of 14-3-3 to raptor cause mTORC1 dissociation from the ULK1 multiprotein complex. It is also possible that AMPK phosphorylates ULK1, resulting in a conformational change that interferes with the interaction between ULK1 and mTORC1. Alternatively, AMPK may activate ULK1 for autophagy induction through direct phosphorylation of ULK1. In conclusion, AMPK, which is an energy sensor coupled to cell growth control, is a new ULK1-binding protein. AMPK associates with the ULK1-mTORC1 complex and promotes autophagy, at least in part, by inhibiting mTOR through phosphorylation of raptor in the ULK1 autophagic complex. The enhanced autophagy promoted by AMPK-ULK1 complex is evaluated by measuring GFP-LC3 punctate foci formation (a well-characterized marker of autophagosomes). Mitochondrial Autophagy Promotes Cellular Injury in Nephropathic Cystinosis,2009. In recent years, cystinosis research has focused on abnormalities in the metabolism of Glutathione ( GSH) after the observation of elevated urinary levels of 5-oxoproline (pyroglutamic acid) in cystinotic patients. Oxoprolinuria is not specific for cystinosis as it has been observed in other genetic disorders affecting glutathione metabolism, such as a deficiency of 5-oxoprolinase or glutathione synthetase. GSH is the main intracellular antioxidant, protecting cells against oxidative stresses. Theoretically, sequestration of cystine in lysosomes may deplete the cytosolic pool of cysteine, which is the primary limiting factor for the synthesis of GSH ( Fig.9 ). An alternative explanation of oxoprolinuria in cystinosis can be an impairment of the Na+/coupled monocarboxylate transporter SLC5A8, which is predominantly responsible for the reabsorption of 5-oxoproline in renal proximal tubules. SLC5A8 dysfunction can cause lactaturia as it has an obligatory role in renal lactate reabsorption. GSH has been measured in several cell models, yielding inconsistent results. Decreased levels of GSH have been reported in cystinotic fibroblasts and proximal tubular cells. Another study performed using human fibroblasts showed no differences in basal GSH levels but documented decreased GSH levels in cystinotic cells upon inhibition of ATP synthesis and after exposure to oxidative stimuli, suggesting that the activity of the ATP-dependent gamma-glutamyl cycle is compromised in cystinosis. Contradicting these results, one study has recently demonstrated a normal GSH/GSSG ratio in a limited number of cystinotic cell lines, suggesting intact redox status. GSH levels are normal both in cystinotic HPV 16 E6/E7 immortalized proximal tubular cells and in cystinotic ciPTEC lines. GSH levels in ciPTEC are also comparable to levels measured in tubular cells in vivo (ca 5 mM). However, in both cell models, GSSG concentrations are increased, suggesting an increased oxidative state. Alterations in the redox state of cystinotic ciPTECs had no effect on the oxidation of proteins or fatty acids, indicating that, at least in vitro, the total cell reduction capacity was sufficient to protect against oxidative damage. Higher metabolic activity, coupled with a nearly exclusive ATP generation from mitochondrial oxidative phosphorylation, may result in higher reactive oxygen species generation in vivo. Therefore, cystinotic tissues may be more vulnerable to oxidative stimuli than estimated in vitro. Recently, it has been suggested that disturbances in gamma-glutamyl cycle, which accounts for glutathione (GSH) synthesis, might link lysosomal cystine accumulation and ATP depletion in cystinosis. Insufficient cellular defense against reactive oxygen species ( ROS ) due to glutathione deficiency can alter mitochondrial oxidative phosphorylation. Furthermore, disturbed glutathione status might reflect an increased mitochondrial ROS production, as it has been demonstrated in mitochondrial disorders. reduced to cysteine by cytosolic reducing systems. Theoretically, the intralysosomal cystine accumulation in cystinosis can result in the cytosolic deficit of cysteine. Cysteine together with glutamate and glycine is needed for GSH synthesis ( Fig. 9 ), requiring two successive enzymatic reactions, both consuming one ATP molecule per enzymatic cycle. The first and rate-limiting reaction couples glutamate and cysteine and is catalysed by g-glutamylcysteine synthetase ( g-GCS ), resulting in the formation of g-glutamylcysteine ( g-GC ). The second reaction couples g-GC with glycine and is catalysed by GSH synthetase ( GSH-S ). Humans with deficient GSH-S accumulate and excrete elevated amounts of 5-oxoproline, due to diminished conversion of 5-oxoproline to glutamate by 5-oxoprolinase . The elevated 5-oxoproline excretion has also been demonstrated in cystinotic patients with Fanconi syndrome, untreated with cysteamine, suggesting an alteration in GSH synthesis in these patients, as widely stated previously. Additionally, the presence of aminoaciduria and metabolic acidosis in patients with a deficiency of g-GCS suggests that GSH deficiency might result in renal proximal tubular dysfunction. GSH is the most abundant cellular thiol, functioning as an important redox buffer. GSH serves as a cofactor for the GSH peroxidase family of enzymes, which metabolize H2O2 and lipid peroxides, defending cells against reactive oxygen metabolites. Glutathione reductase, using the NADPH oxidase system, is necessary to regenerate GSH. GSH depletion results in mitochondrial dysfunction in several cellular and animal models and therefore might affect ATP synthesis in cystinosis. Interestingly, increased glutathionylation of the mitochondrial complex I due to elevated mitochondrial glutathione disulfide (GSSG) has been shown recently to increase superoxide production. An increased superoxide production has been demonstrated by chemiluminescence assay in isolated polymorphonuclear (PMN) cells and mononuclear phagocytes from cystinotic children. GSH has also a role in maintaining the intracellular pool of cysteine via the reaction catalysed by g-glutamyl transpeptidase (g-GT), resulting in formation of cysteinyl-glycine. Taking these considerations together, it has been suggested that GSH deficiency might link intralysosomal cystine accumulation and mitochondrial dysfunction in cystinosis. Figure 9: g-Glutamyl cycle. 1 g-glutamylcysteine synthetase(g-GCS); 2 glutathione synthetase (GSH-S); 3 g-glutamyltranspeptidase(g-GT);4 gglutamylcyclotransferase; 5 5-oxoprolinase; 6 cysteinyl glycinase. Probably the most important finding of this study is significantly increased GSSG and concordantly GSSG/total GSH ratio , present in both cystinotic fibroblasts and PMN cells, which reflects a changed redox potential in the studied cells. The redox regulation of gene expression and intracellular communication is just emerging as a vital mechanism in health and disease. As mitochondria are important sources of intracellular reactive oxygen species (ROS), it is tempting to speculate that cystinotic cells are less protected from mitochondrial free radical production. Mitochondrial superoxide is converted to H2O2 by inducible Mn-superoxide dismutase ( Mn-SOD) and, when released to the cytoplasm, can change the redox state to the rest of the cell. Increased free radical production can be responsible for increased apoptosis, demonstrated in cystinotic fibroblasts and renal tubular epithelial cells. In agreement with this hypothesis, increased activity of SOD, used as an index of superoxide overproduction, has been demonstrated in cystinotic fibroblasts. Increased oxidative stress might be the missing link between cystine accumulation within the lysosomes and two other proposed pathogenic mechanisms of cystinosis such as mitochondrial dysfunction and apoptosis. In conclusion, although no depletion of absolute GSH and cysteine contents is found in cystinotic fibroblasts and PMN cells, data demonstrate an inverse correlation between cystine accumulation and intracellular GSH content. In addition, the elevated GSSG might indicate the presence of increased oxidative stress, which can be responsible for cell damage in cystinosis. An increased peroxidation in, for example, proximal tubular cells could have striking results on the signal transduction in these cells. In this study, the product of the phosphorylation of sedoheptulose is found to be sedoheptulose-7P. However, since sedoheptulose-1P is not commercially available, further investigations are needed to definitely prove the position of the phosphate group. The low apparent Km of 0.06 mM in fibroblasts, together with the elevated excretion of sedoheptulose in patients missing the CARKL gene, suggests that sedoheptulose is the main substrate for this enzyme. Sedoheptulose-7P is the form that appears in animals and plants and is a key intermediate in the PPP. 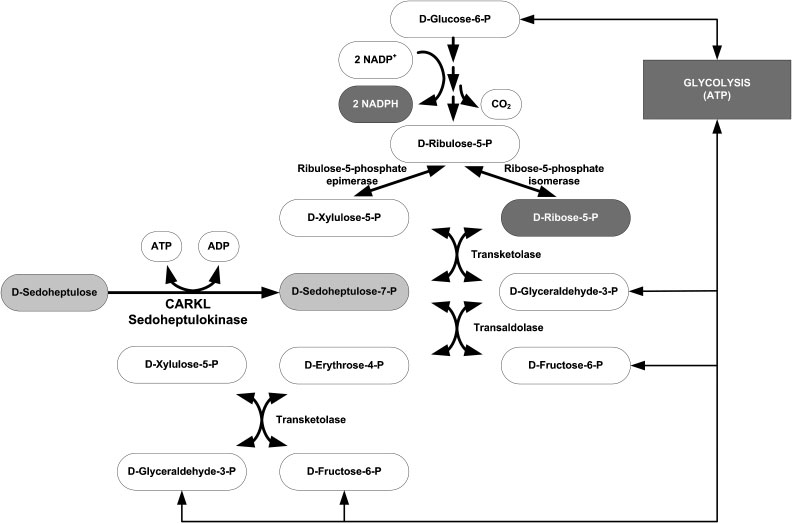 To understand the biochemical function of CARKL, it is necessary to consider its role in the PPP. The two major functions of the PPP are as follows: 1) to provide NADPH, which is essential to counteract oxidative damage, for reductive biosynthesis and detoxification; and 2) to generate fivecarbon sugars for the synthesis of nucleic acids. The flow of glucose 6-phosphate through the PPP depends upon the requirement for NADPH, ribose-5P, and ATP ( Fig. 10). Glyceraldehyde-3P, the cosubstrate, together with sedoheptulose-7P of transaldolase and transketolase, can be redirected from the glycolytic pathway to the PPP when there is an increased need for NADPH or ribose-5P. display a very mild phenotype since sedoheptulose-7P and glyceraldehyde-3P can also be formed through reactions of transaldolase and transketolase. Cystinosis patients with the common 57-kb deletion have the severe infantile nephropathic type. Deficiency of SHK activity in cystinosis patients with the common 57-kb deletion explains the accumulation of sedoheptulose in urine from these patients. Understanding the elevation of erythritol is not so straight forward. Erythrose and dihydroxyacetone may be the precursors of sedoheptulose formed by an aldolase reaction, resulting in accumulation of erythritol from erythrose if sedoheptulose accumulates. In conclusion, since phosphorylation of sedoheptulose is connected to the pentose phosphate pathway and the pentose phosphate pathway is responsible for the production of NADPH, which has similar antioxidant functions as GSH, it could be speculated that defects in CARKL might influence the NADPH levels, hence, intracellular redox status. This conditions results in making cistinotic cells more vulnerable to oxidative stress, which leads to severe renal injuries observed in nephropathic cystinotic phenotype. To evaluate the entity of a higher rate of oxidative stress in cystinotic patients Vaisbich et all. used serum TBARS, a marker of OS and compared the results with those observed in healthy controls and correlated with renal function parameters. The following renal function parameters were evaluated: serum creatinine, BUN and creatinine clearance estimated by the Schwartz formula. Serum levels of thiobarbituric acid-reactive substances (TBARS), which are markers of lipid peroxidation, were determined using the TBARS assay. In brief, 0.2 ml of serum sample was diluted in 0.8 ml of distilled water. Immediately thereafter, 1 ml of 17.5% trichloro-acetic acid was added. Following the addition of 1 ml of 0.6% thiobarbituric acid, pH 2, the sample was placed in a boiling water bath for 15 min, after which it was allowed to cool. Subsequently, 1 ml of 70% trichloroacetic acid was added, and the mixture was incubated for 20 min. The sample was then centrifuged for 15 min at 2,000 r.p.m. The optical density of the supernatant was read at 534 nm against a reagent blank using a spectrophotometer. The quantity of TBARS was calculated using a molar extinction coefficient of 1.56 × 105 M–1 cm^–1 . Serum levels of TBARS (expressed as nmol/ml) were compared between patients and healthy controls, and associations between this parameter and parameters of renal function were assessed. Using this simple methodology, it has been observed that plasma TBARS, a biomarker of oxidative stress, was increased in patients with nephropathic cystinosis. The balance between oxidants and antioxidants is considerably distorted in patients with chronic renal insufficiency. Evidence suggests that ROS are not merely the consequence of treatment or progressing disease but also one of the causal agents of chronic renal impairment, and that oxidative stress can occur even in the absence of hemodialysis. Patients with uremia have diminished response to oxidative stress probably due to a decrease in the antioxidant capacity; the mechanisms underlying this decrease, however, remain to be elucidated. However, in this study, there was no possibility to correlate TBARS levels with creatinine clearance, CKD stage, serum creatinine or BUN. Therefore, in cystinosis patients oxidative stress could be a result of the intrinsic mechanism of the disease. Oxidative stress results in the formation of highly reactive and unstable lipid hydroperoxides, and decomposition of unstable peroxides derived from polyunsaturated fatty acids results in the formation of malondialdehyde, which is measured by the TBARS assay. This knowledge may have implications on the treatment of cystinosis patients, since oxidative stress is involved in the progression of renal disease, especially in these patients. Altered status of glutathione and its metabolites in cystinotic cells,2005. Elevated oxidized glutathione in cystinotic proximal tubular epithelial cells,2005. Sedoheptulokinase Deficiency Due to a 57-kb Deletion in Cystinosis Patients Causes Urinary Accumulation of Sedoheptulose: Elucidation of the CARKL Gene, 2008. Patients with cystinosis frequently exhibit blond hair and fair complexion, suggesting an alteration in melanogenesis. However, the pigmentation singularities of these patients have not been studied, and the role of cystinosin in melanogenesis has remained unknown. A clinical evaluation of 27 patients with cystinosis showed that 44% had a cutaneous pigmentation dilution compared to their relatives. Analysis of the hair melanin content in these patients by HPLC demonstrated a 50% decrease in eumelanin (4360 vs. 9360 ng/mg), and a 2-fold increase in pheomelanin (53 vs. 20 ng/mg), the yellow/red pigments. Cystinosin-deficient mice also showed a 4-fold increase in hair pheomelanin content. In vitro studies showed that cystinosin was located at melanosomes. 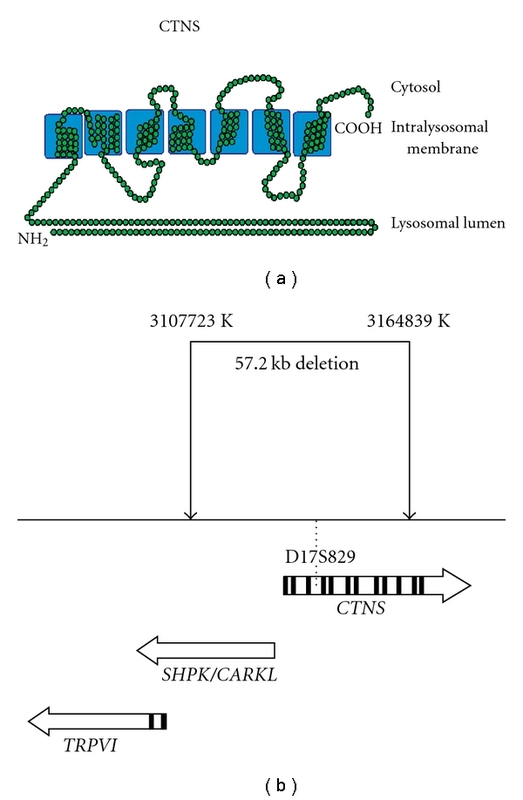 CTNS silencing led to a 75% reduction of melanin synthesis that was caused by a degradation of tyrosinase by lysosomal proteases. These results objectify the pigmentation defect in patients with cystinosis. Interestingly, patients with cystinosis exhibit hypopigmentation; Caucasian subjects often have blond hair, blue eyes, and light complexion. However, it seems that some patients, in particular, African-American patients, have no hypopigmentation. A recent study of 208 patients with cystinosis reported hypopigmentation of the retinal pigment epithelium in the periphery, with pigmentary stippling in 43% of cases. Because the pigments found in the retinal epithelium, hair, and skin are melanins, cutaneous and retinal hypopigmentation may be caused by the same mechanism. In humans, pigmentation results from the synthesis and distribution of melanin in the skin, hair bulbs, and eyes. Melanin synthesis, or melanogenesis, is an enzymatic process that is catalyzed by tyrosinase, tyrosinase-related protein 1 (Tyrp1) and dopachrome tautomerase (DCT), which convert tyrosine to melanin pigments. This process takes place in melanocytes within the lysosome-related vesicles named melanosomes. Two types of pigments are produced by melanocytes: eumelanins, which are black/brown pigments, and pheomelanins, which are yellow/red sulfur-containing pigments. Eumelanins play a key photoprotective role against UV-induced DNA damage and skin cancer. Conversely, pheomelanins appear to be deleterious and may favor skin cancer development. Although it has been shown that the levels of tyrosinase, Tyrp1, and DCT play key roles in pigment production, the content of cystine and its reduced form, cysteine, may also be a very important regulator of melanogenesis. Pheomelanins contain sulfur, which may be provided by the cystine that is available in the melanosomes. Chintala et al. have recently shown that the gene SCL7a11, which encodes a cystine-glutamate exchanger, is directly responsible for cystine transport into melanocytes and possibly into melanosomes. The subtle gray (sut) mouse, which produces less pheomelanin than a normal mouse, has a mutation in the Slc7a11 gene, demonstrating the major regulatory roles of Slc7a11 and cystine in pheomelanin pigment synthesis. In a recent study, an objective evaluation of skin and hair pigmentation in patients with cystinosis were performed. In addition, the role of cystinosin in melanogenesis in vitro has been studied. These results clearly show that patients with cystinosis have a cutaneous pigmentation defect in comparison with their relatives. Analysis of the melanin content and the composition of the patients’ hair demonstrated a decrease in eumelanin and an increase in pheomelanin. In vitro analysis showed that Ctns silencing led to a loss of melanin synthesis that was caused by the lysosomal degradation of tyrosinase. These results depict the role of cystinosin in melanogenesis and add CTNS to the list of the genes that are involved in the control of skin and hair pigmentation. First, real time PCR analysis of cystinosin gene (Ctns) expression in mouse adipocytes, liver, skeletal , muscle, kidney and B16 mouse melanoma cells showed a strong expression of Ctns in mouse melanoma cells that was comparable at those found in kidney. Next, using a CTNS-GFP construct, it has been showed by immuno-fluorescence and biochemistry studies that CTNS-GFP co-localized with mature melanosomes. Further, immune-precipitation of intact melanosome showed the presene of GFP-CTNS in TYRP1 containing vesicles. These data suggest that CTNS is a melanosomal protein. It has been showed that Ctns silencing (siCTNS) inhibited cell pigmentation and reduced melanin synthesis by more than 50% compared to control cells (siCont). This effect was due to a decrease in the tyrosinase level through a post-transcriptional process. Indeed, CTNS silencing induces a dramatic decrease in tyrosinase protein expression, but does not affect the expression of tyrosinase messengers. CTNS silencing does not affect Tyrp1 and DCT expression. The hypothesis proposed is that CTNS might control tyrosinase stability/ degradation. Two pathways have been involved in tyrosinase degradation. One involves the proteasome and the other one involves cysteine proteases. Using the specific proteasome inhibitor MG132, it emerged that proteasome inhibition did not prevent the decrease in tyrosinase expression evoked by CTNS specific siRNA. As positive control of MG132 functioning, it has been showed an increase in HIF1a expression in these conditions. On the other hand, the inhibition of cysteine protease, by E64 and leupeptin prevented the degradation of tyrosinase. These data suggest that tyrosinase is degraded by lysosome proteases. Since CTNS is a cystine/H+ co-transporter, it was tempting to propose that Ctns silencing would affect melanosomal pH. Indeed, in cells transfected with si-Ctns it has been observed an increase in immunofluorescence labeling with Lyso-tracker® indicating that Ctns silencing led to an acidification of the intracellular vesicular compartments. To identify these intracellular vesicles the N - ( 3 - ((2,4-dinitrophenyl) amino) propyl) – N - ( 3 - aminopropyl) methylamine, dihydrochloride (DAMP), a weak base that accumulates in acidic compartments, has been employed. DAMP was then localized by anti-DNP (dinitrophenol) antibodies. Melanosomes were identified by anti- Tyrp1 antibodies. In basal conditions, melanosomes (orange/red) appeared located around the nucleus and co-localized more or less with DAMP (green). After treatment with αMSH, melanosomes were found mainly at the cell periphery and little co-localization with DAMP could be observed, indicating that during cAMP induced differentiation melanosomes became less acidic. Interstingly, when cells were transfected with siCTNS, we observed a strong increase in the DAMP labeling (green) and most of the melanosomes appear yellow/green indicating that CTNS silencing caused an acidification of the melanosomes. Interestingly treatment with bafilomycin a VATPase inhibitor restores both tyrosinase expression and melanin synthesis. It has been shown that forskolin increases Ctns mRNA in both normal human melanocytes and B16 melanoma cells and activates the CTNS promoter. However, MITF, a transcription factor that mediates most of the effect of cAMP on melanocyte differentiation, is not involved in the regulation of CTNS by cAMP. The effect of CTNS silencing on melanocyte growth has also been investigated. Using XTT method a 50% decrease in cell growth after transfection with siCTNS was observed. FACS analysis of DNA content showed that cells depleted in CTNS were blocked in G1 phase. No apoptosis (subG1) could be observed. Further western blot analysis with anti Phospho-pRB and anti-p27 antibodies showed that CTNS silencing decreases pRB phosphorylation and increased p27 expression, in total agreement with a G1 arrest. Ctns knockout mouse model was generated using a promoter trap approach. The truncated protein was mislocalized and nonfunctional. Ctns-/- mice accumulated cystine in all organs tested, and cystine crystals, pathognomonic of cystinosis, were observed. Ctns-/- mice developed ocular changes similar to those observed in affected individuals, bone defects and behavioral anomalies. Interestingly, Ctns-/- mice did not develop signs of a proximal tubulopathy, or renal failure. We have shown in both C57bl6 and agouti mice with non functional CTNS a increased pheomelanin content in hair of this mouse compared to wild type mouse, suggesting that CTNS is able to favor eumelanogenesis probably by decreasing the intramelanosomal cystine concentration. Interestingly, these mice have the same coat color due to high basal level of eumelanin ( Fig. 11 ). The absence of clinical phenotype in C57bl6 mice might a reminiscence of the picture observed in dark-skin patients who have no hypopigmentation. Taken together these data led us to propose the following hypothesis: Melanosomes derive from early endosomes. Four types of melanosomes can be identified by their morphology and their melanin contain. It seems that type II melanosomes are more acidic than type III which contain tyrosinase and synthesize melanins. CTNS, which seems to be preferentially located within type III melanosomes, might participates in the alkalinization of these melanosomes, favoring thereby melanin synthesis. In absence of CTNS, the pH of type III melanosomes remains acidic leading to the miss targeting of tyrosinase to lysosome and its subsequent degradation. Alternatively, the decrease in melanosome pH might led to the reactivation of lysosomal cysteine proteases such as cathepsins that work preferentially at acidic pH and that were found in melanososome. However, the lack of global pigmentation defects in CTNS KO mice suggest the existence of additional regulatory mechanisms that remain to be elucidated. Figure 12: Schematic representation of cystinosin functioningin melanocytes. The greater degree of colocalization ofcystinosin with Tyrp1 than with HMB45 (pMEL17, Silv) sug-gests that cystinosin is targeted to the mature melanosome.This hypothesis is consistent with the observation that theearly melanosome is more acidic than the mature melano-some. Cystinosin may favor the neutralized pH of themature melanosome. The neutral pH may be a signal fortyrosinase targeting to the mature melanosome and may alsoallow proper tyrosinase functioning and melanin synthesis tooccur. In the absence of functional cystinosin, mature mela-nosomes may remain acidic; this may lead to mistargeting oftyrosinase to the lysosome compartment and subsequenttyrosinase degradation by lysosomal proteases. Of course,cystinosin plays a key role in the control of cystine content inmelanosome and could thereby influence the eumelanin/pheomelanin ratio. Cystinosin is a melanosomal protein that regulates melanin synthesis,2012. FINAL REPORT: MOLECULAR MECHANISMS OF HYPOPIGMENTATION IN CYSTINOSIS, 2013. Treatment of cystinosis can be divided into the management of symptoms and complications, and specific therapy targeting the root cause of the abnormality, i.e. lysosomal cystine accumulation. Prior to renal transplantation, replacement of renal losses due to Fanconi syndrome is life-saving. This includes provision of fluids and electrolytes, especially potassium, citrate, bicarbonate therapy or Scholl’s solution, and phosphate (for hypophosphatemic rickets). Vitamin D is often used to enhance gastrointestinal phosphate absorption, and calcium may be needed to prevent and treat tetany. Thyroxine replacement is commonly required. Children whose height remains below that of the third percentile can benefit from growth hormone therapy. For ESRD, hemodialysis and peritoneal dialysis are temporizing measures while patients await renal replacement therapy. When a live donor is available, pre-emptive transplantation is preferred. Both living donor kidneys and cadaveric kidneys perform very well in cystinotic patients. Advances in anti-rejection medications have vastly increased the pool of potential kidney donors for cystinotic patients, and heterozygous relatives are included among the acceptable donors. Recently, the use of steroid-free immune suppression has been employed in selected centers. Retention of the native kidneys can result in persistence of renal tubular Fanconi syndrome in cystinotic patients that have received transplants, but the donor kidney does not itself develop Fanconi syndrome. Cystine crystals can be observed in a donor kidney, but this occurs because of invasion of host cells; the crystals appear in the interstitium and not in the tubular epithelium. Renal transplantation does not correct the systemic metabolic defect of cystinosis. In 1974, Thoene et al., reasoning that storage of cystine causes the manifestations of the disease, began to study agents that could potentially deplete cystine. They found that an aminothiol, cysteamine ( Beta-mercaptoethylamine ), rapidly depletes cystinotic fibroblasts of cystine. Later, they demonstrated the mechanism of cystine depletion by cysteamine. The free thiol traverses the plasma and lysosomal membranes to participate in a disulfide interchange reaction with cystine inside the lysosome. 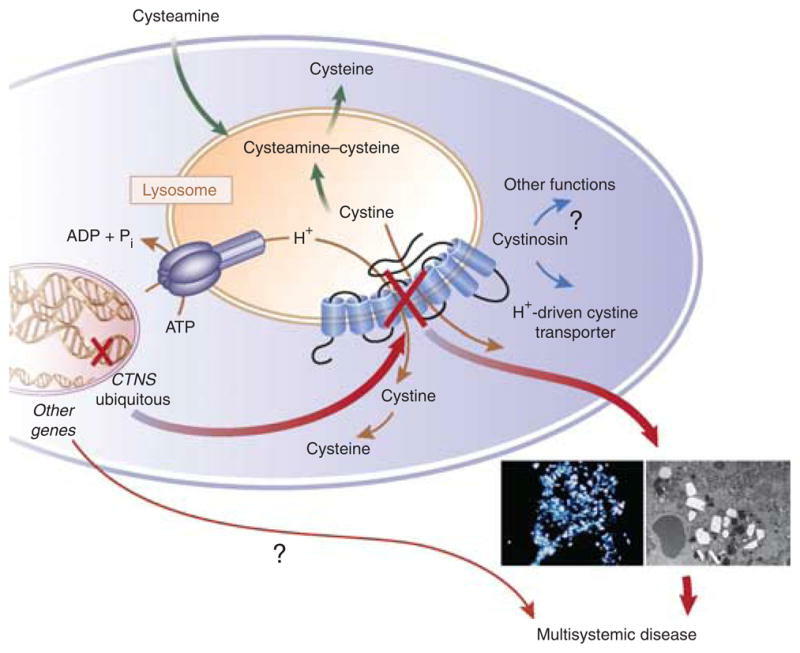 The two products formed, cysteine and cysteine–cysteamine mixed disulfide, both exit the cystinotic lysosome by a process not requiring the mutant cystinosin protein. In fact, the mixed disulfide leaves via a lysine transporter. Cysteamine, administered orally at the dose of 60 mg/kg per day to 90 mg/kg per day every 6 h, can deplete intracellular cystine by 90%. Leucocyte cystine measurements are used to gauge compliance and adequacy of dosing. In the 1980s and 1990s, long-term oral administration of cysteamine was shown to retard the rate of renal glomerular deterioration and to improve linear growth of children with cystinosis. Later, retrospective analysis of 30 years of experience at the National Institutes of Health demonstrated much improved creatinine clearance and growth in cysteamine-treated compared with those in untreated patients. In fact, early cysteamine therapy actually allowed for growth of renal capacity, rather than loss of glomerular function, in the first 3 years of life. Other data address the effectiveness of cysteamine in preventing damage to different parenchymal organs, including the thyroid. Oral cysteamine therapy is now the treatment of choice for pre-transplant cystinotic patients and was approved by the United States Food and Drug Administration in 1994 as Cystagon. Cysteamine, however, has its drawbacks. It tastes and smells foul, and 10–15% of patients do not tolerate a full dosing regimen. Many patients suffer nausea, vomiting and gastrointestinal discomfort, perhaps due to stimulation of gastric acid and gastrin production; proton pump inhibitors may be helpful in this regard. Responses to cysteamine treatment are variable, reflecting genetic heterogeneity. The Fanconi syndrome of cystinosis does not appear to respond to long-term cysteamine therapy. Finally, with respect to renal glomerular function, an optimal response requires early treatment. While orally administered cysteamine exerts striking systemic effects in cystinosis, it does not dissolve corneal cystine crystals. For that, topical cysteamine eyedrops (0.55%, given 6 to 12 times per day) are required. This treatment can dramatically ameliorate the photophobia of cystinosis within weeks, decreasing the risk of blepharospasm. The drops can dissolve corneal cystine crystals completely within 1 or 2 years, often clarifying the cornea (Fig. 3b, c). Corneal transplantation is seldom indicated for the corneal crystals of cystinosis (Fig. 3 ). Cysteamine treatment increased total glutathione in both control and cystinotic cells and normalized cystine levels and glutathione redox status in cystinotic cells. However, cysteamine did not improve decreased sodium-dependent phosphate uptake. These data implicate that cysteamine increases total glutathione and restores glutathione redox status in cystinosis, which is a positive side-effect of this agent next to cystine depletion. This beneficial effect points to a potential role of cysteamine as anti-oxidant for other renal disorders associated with enhanced oxidative stress. Although cysteamine improves the outcome and complications of cystinosis, it does not prevent them. Why does cysteamine delay the complications of cystinosis but not prevent them? Cysteamine, by allowing cystine to exit the lysosomes, overcomes the major function of the missing cystinosin but does not replace cystinosin. Even if the level of cystine in white blood cells is low, what is the impact of cysteamine therapy on the tissues? Little is known about this, for obvious reasons, but data suggest that cystine storage in tissues is not completely cleared by cysteamine. Moreover, the fact that cysteamine does not treat the proximal tubulopathy shows that the physiopathology of cystinosis is more complicated than expected, and cystinosin may have other functions still to be identified. Gahl et al. have mentioned that significantly more deaths and complications were observed in patients homozygous for the 57–kb CTNS deletion compared with patients with only mutations. Brodin-Sartorius and colleagues did not observe any significant difference between these two groups in survival or appearance of the renal and extrarenal complications. A more comprehensive study on genotype–phenotype correlation would be necessary, but in regard to years of clinical reports, this correlation is not evident, which suggests the existence of modifier genes responsible for the broad range of phenotype in patients with or without cysteamine. This could explain why, among patients who start cysteamine early and have good compliance, some will develop ESRD or other complications before 15 years of age and some will experience fewer symptoms, later in their lives. The existence of these genes that influence the phenotype of cystinosis is obvious in the different mouse models of cystinosis that Antignac’s group generated. The Ctns −/− mice on a mixed 129/Sv×C57BL/6 genetic background did not have any renal dysfunction, nor did the FVB/N pure-background mice, whereas the Ctns −/− mice on a pure C57BL/6 background developed renal dysfunction as early as 6 months of age and end-stage renal failure by 15 months. The identification of these other genes that influence the severity of the disease in the context of cystinosis should be of high interest and would help to better understand the physiopathology of cystinosis and the high variability of symptoms even with cysteamine therapy. What is life like with cystinosis? In meeting families with cystinosis, we realized that this is an everyday fight, that cystinosis patients must take not only cysteamine every 6 h, but also many other drugs and supplements around the clock every day. Many of the children need a gastric tube to absorb and tolerate all these medications. And still they develop many complications and have frequent hospital visits. The question is, how we can gain a better idea of the status of health in patients taking cysteamine? Publications on a large cohort of patients such as Brodin-Sartorius and colleagues’, recapitulating years of medical follow- up, are important. The major problem with this study is that these data are based on reviews of medical records, and the mean age at the start of the therapy was 9.9 years, much later than most cystinosis patients start cysteamine today. Thus, a historical review might influence negatively the data reported. How can current data be collected and reported? The new Cure Cystinosis International Registry (CCIR) could be a useful tool for this purpose. The CCIR uses a comprehensive questionnaire filled out online by patients or family members regarding the tolerance to cysteamine, their compliance, and the symptoms they are experiencing. The weekly statistical analyses are available for professionals. To date, 230 patients have registered, 221 of them have been treated with cysteamine, and 83.2% started cysteamine before 5 years of age, an age shown to be critical by Brodin-Sartorius and colleagues. Still, 29.9% of the patients who started cysteamine early had at least one kidney transplant, 78.2% of those before the age of 16 years. In addition, 47.8% of the patients who started cysteamine early experienced muscle weakness, and 23.9% hypothyroidism. These current data on a large cohort of patients show again that ESRD and complications are occurring even when cysteamine therapy is started early in life. In addition, cysteamine is challenging to take and difficult to tolerate. The need for frequent doses (oral every 6 h plus eye drops once an hour) necessitates that medications be carried for all activities, but the most significant impact of the every-6-h dosing schedule is that cystinosis patients never sleep through the night. Cysteamine also has a number of undesirable side effects, such as persistent odor and halitosis, along with more severe side effects of vomiting and diarrhea that render its administration difficult. Some patients stop taking cysteamine because they cannot tolerate it. Brodin-Sartorius and colleagues report that 28% of the patients in their study had extended periods without cysteamine. The CCIR reports that 7.8 of the patients currently do not take cysteamine, 68.7 of these because of the side effects and tolerance. The drug side effects and frequent dosing have a direct negative impact on the patients ’ and families’ quality of life. A comprehensive study in this area is necessary. What is the outlook for patients with cystinosis? A new, delayed-release formulation of cysteamine (DR Cysteamine) is currently being developed by Raptor Pharmaceutical on the basis of a study conducted by Dohil et al. The company recently completed its pivotal, phase 3 clinical study. This new formulation needs to be taken twice daily, so the patients will be able to sleep through the night, and it will reduce the gastrointestinal side effects. Cysteamine restores glutathione redox status in cultured cystinotic proximal tubular epithelial cells,2011. Cysteamine therapy: a treatment for cystinosis, not a cure,2011. Using the Ctns −/− murine model for cystinosis, it has been tested the use of hematopoietic stem and progenitor cells (HSPC) genetically modified to express a functional CTNS transgene using a self-inactivating lentiviral vector (SIN-LV). It had been showed that transduced cells were capable of decreasing cystine content in all tissues and improved kidney function. Transduced HSPC retained their differentiative capabilities, populating all tissue compartments examined and allowing long-term expression of the transgene. Direct correlation between the levels of lentiviral DNA present in the peripheral blood and the levels present in tissues were demonstrated, which could be useful to follow future patients. Using a new model of cystinosis, the DsRed Ctns −/− mice, and a LV driving the expression of the fusion protein cystinosin- enhanced green fluorescent protein (eGFP), it had been showed that cystinosin was transferred from CTNS-expressing cells to Ctns-deficient adjacent cells in vitro and in vivo. This transfer led to cystine decreases in Ctns-deficient cells in vitro. These data suggest that the mechanism of cross-correction is possible in cystinosis. To sum up Hematopoietic stem cell transplantation, which has a significant therapeutic benefit in the mouse model of cystinosis, could be the next treatment for cystinosis. However, proof that cell therapy has the same benefits in patients as in mice still needs to be demonstrated. Hematopoietic Stem Cell Gene Therapy for the Multisystemic Lysosomal Storage Disorder Cystinosis,2012. Is genetic rescue of cystinosis an achievable treatment goal?,2013.